One of my FAVORITE sandwiches ever is at Il Tramezzino. There are a couple locations around Los Angeles- one in Tarzana, Studio City, & Beverly Hills. I go to the one in Tarzana, because that is closest to where I live. 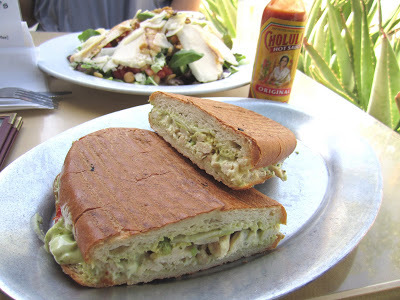 Located on Ventura Blvd., Il Tramezzino is a very popular lunch spot. This Italian Cafe has amazing sandwiches, salads, fresh fish and pizzas. Everything on the menu is delicious, but they are known for their grilled sandwiches, and there is one in particular that made this place famous. For those of you who read my blog, you probably know that sandwiches and burgers are my favorite food. Their Grilled Breast of Chicken Sandwich (first sandwich featured on the menu), is up as one of the tops of my list for favorite sandwiches. This sandwich is actually grilled “panini style” with sun dried tomato, avocado, provolone cheese & a basil garlic sauce. The basil garlic sauce is like a pesto mayo- which is one of my favorite condiments ever. This sandwich is amazing with Cholula hot sauce too. I regularly add hot sauce to any sandwich I eat, but on this sandwich in particular is amazing. The bread is fresh and crispy, and the combination of everything works perfectly. I love that basil garlic mayo sauce. It makes the sandwich. I’ve had other amazing grilled sandwiches at Il Tram (they’re all good), but this one is my favorite. Sandwich w/ Cholula Hot Sauce…compliments it well. My friend ordered the Insalata Lorenzo, made with mixed baby greens, chopped romaine, grilled chicken breast, chopped roma tomato, avocado, garbanzo beans, pine nuts & shaved Parmesan with their special red wine balsamic vinaigrette on the side. All their salads are fresh and yummy. Great selection of different salads too. For dessert, we ordered their famous Croissant Nutella with Banana & Strawberry. This is heaven. It’s heavy because of the bread but it’s so good. Great dessert to split with someone.